After Farscout is attacked by a rival wolf pack, Willow and Rainpace are sent to find their elder. Night was falling, ushered in by cool gusts of wind that whipped browning leaves from branches and warned the two elves that the seasons were quickly changing. **There won�t be any beesweets if this keeps up,** Willow sent, her mental voice a grumble. **What? The cool nights? ** Rainpace asked as he adjusted his mantle to better block the gusty wind. He didn�t like his friend�s glum tone. But at least she was talking. He was willing to take that as a small victory, after the last two days of grudging silence. Willow had sulked when Windburn had not given her permission to make alone her last honey gathering trip for the season. The chief�s command could not have been a surprise � in the years since the arrival of humans in the Holt�s forest, Windburn�s orders had always been that no member of the tribe, save for their scouts, was to travel alone if they were going to go out beyond the irregular ring of the thornwalls. Yet Willow had taken Windburn�s refusal to her request with ill temper, and she still hadn�t been pleased when Rainpace himself had volunteered to accompany her. Something was wrong with his friend. Rainpace sensed it, and he was worried about her. Notch had laughed at him when he had said it aloud, but Rainpace still felt she been avoiding her two closest friends all summer. Rainpace had hoped that maybe this time alone with her would give him a chance to talk, and figure out what the dark clouds were which had been shadowing her for the last many long weeks. But Rainpace�s hopes couldn�t have been more wrong. The trip was as miserable as being left to soak out in a pouring, cold rain. Willow avoided or ignored any of his attempts at conversation, beyond simple, superficial observations of the weather or of the forest around them. **I have enough travelcakes for us both,** he countered. **You know as well as I that the rabbits won�t leave their nests until dawn anyway. ** Rainpace found fallen log at the meadow�s edge to use for a windbreak. He stamped down some ferns to provide dryer seating than the forest loam, and gestured for Willow to join him as he fished a wrapped travelcake from his shoulder pack. Willow�s expression was tight and sour, as if his offer had trapped her. He smiled at her, all bland innocence. �Goldspice�s travelcakes. She makes the very best,� he said, breaking one of them in two and holding it out to Willow. Then, unexpectedly, a sending flashed past them, a brief flaring tickle that brushed by as subtle as a bat's shadow at dusk. As insubstantial as sendings were, sometimes a locksending could do that, when it was heavy with information and cast between two strong senders. Rainpace shivered from that feather-soft touch, and saw Willow�s glancing frown toward him, confirming that she, too, had felt that passing presence. You could not orient the direction of a sending as you could sounds, so Rainpace could not tell from where the communication had come. But there weren�t any hunting parties nearby. The Hunt Leader had left the Holt the day before his and Willow's departure, and that group had gone east, toward the plains. A touch of foreboding worked its way up his spine and made the hairs on the back of his neck stand on end. He caught Willow�s eye and held her gaze, knowing she shared his sickly promotion of trouble. Rainpace nodded automatically, as if his chief could see or feel the gesture. **How badly is Farscout hurt? ** Rainpace asked, feeling another shiver run down his spine. Rainpace felt the mental connection from Windburn close. Beside him, Willow tucked the travelcake into her own travel pouch, and whistled sharply for their straying wolf-friends. They had ridden fast until the moons where high overhead before they stopped long enough to howl. Farscout had answered them, his distant voice ragged. There had been no contesting howls, as there would have been if a strange pack was testing the Holt�s border or pressing a claim. Willow had taken comfort from that. It had been a good sign that whatever interlopers Farscout and his old wolf-friend had tangled with, the intruders were either dead or beaten enough that they had sulked off to safer ground to lick their wounds in silence. They would be likely to following Farscout, and if they had been, they would reconsider the chase once they knew that Farscout�s packmates were racing to join him. It was one thing for a intruding pack to pick a fight with a single wolf and its rider. It would take an unusually large pack to brave a fight with four � and stranger-wolves who didn�t know better would count the elves� howls for wolves. Yet now it was dawn, and when she, Rainpace, and their two wolves howled again, needing Farscout�s response to guide them to him, all they got was silence. Willow clutched her spear, her ears straining for any whisper of response. Grizzle�s graying ears were equally alert, and his body beneath hers was taut with excitement. He understood they were looking for Farscout, but Grizzle was more keen on the point of intruders and defend chase bite not-pack send running with tails tucked. He pushed that image at his elf-bond now, shivery blood-flavored images of himself with Willow on his back, chasing stranger-wolves, with Bristlepelt, Bracken and their riders at his heels as an intruding pack fled before them. Even an old, wise wolf like Grizzle had problems with the concept of death, when the immediacy of it wasn�t on hand to be experienced through the senses. A wolf�s mind couldn�t imagine the future as being different from what he knew through his senses today, and Bracken had been a high-ranked member of the pack since before Grizzle�s birth. Willow didn�t try to correct her wolf-friend, or push images back at him of Bracken's absence. Grizzle wouldn't comprehend Bracken's death until he smelled proof of it on Farscout's clothing, or on Bracken's skinned pelt if Farscout was carrying it. Where ever Farscout was. Willow pushed that image at her wolf-friend instead, of them finding Farscout, of the tall elder walking alone through the trees. Grizzle took the image from her with little interest, still seized with his outrage over intruders who needing to be routed. With no help from that quarter, Willow leaned her head back and howled again, adding urgency to the slide of the notes. Grizzle added his voice to that howl, his tones directed still at the stranger-pack, aggressive and challenging them to come and find him if they had any fight left in them. Rainpace and Bristlepelt quickly joined that chorus, the elves howling in question, the wolves howling with defiance. In the silence that followed, Willow listened intently, waiting again for any response. For several long heartbeats there was nothing except for the soft whisper of wind in the leafless branches overhead, and for the breathing of her companions. Then an open sending touched her. It was Farscout. He was close by, somewhere to the northeast of them, following a creek in its southward course. His wordless send touch her for only a moment, but it was rich with information in that masterfully way that only the other elders of their tribe could match. She could smell the forest loam disturbed by his last step, and feel the barest breath of the wind against the flushed skin of his face. He had been walking for hours, he had a wounded arm which ached, and he was growing feverish. He gathered from her and Rainpaace in that shared moment that they were alone. He was much more familiar with this portion of the tribe's territory than she or Rainpace were; from the pulse of their send he knew where they stood, and he directed them toward where they could meet, at a spot where the creek he was following widened into a pool, in a grove under the shelter arms of ancient capnut trees. **I know that grove,** Rainpace said, the first spoken words of the sending, and then Farscout was gone, cut short with an abruptness that Willow didn't like the feel of. Farscout was never talkative at the best of times, but she had never experienced that sort of severed sending from him. No -- it was a deceptive maneuver more like Notch in its flavor, to abbreviate a send before a full truth could be shared. Rainpace was looking her way, his eyes eloquent with worry. She bit off a fresh upwelling of annoyance with her friend � Rainpace was always looking at her with worry these days, and she wanted nothing of the comfort he was seeking to give and obtain in equal measure. She wanted nothing but to keep safely him at arm�s length, and to avoid his gnat�s buzz of questions. Willow felt a moment�s sympathy for their elder. She swallowed that down. �You know the grove he�s looking for? Take the lead, let�s go,� she said crisply. Rainpace�s dark eyes lingered on her face for a moment, asking questions she didn�t want asked. Then he nodded and urged Bristlepelt forward again. Grizzle rumbled warning at that, being higher in rank than Rainpace�s she-wolf and not tolerant of transgressions. But Willow checked him with a firm wolf-send, and he submitted grudgingly, with the promise of stranger-wolves to bite and chase. With Rainpace at the led, they rode at the wolves� ground-eating lope, following the slope of the land down again until she found the creek Farscout had imaged for them. Then Bristlepelt turned north and followed it. It wasn't too much farther before the slender trees gave way to the edge of a darker grove of ancient capnut trees, and within that grove, surrounded by a gold and red layer of fallen leaves, lay the wide pool where Farscout had promised to meet them. "Farscout!" Rainpace called, the first to spot their elder there. The scout was crouched on his haunches at the water's edge drinking water from a cupped hand. He rose, his balance not quite certain, and limped as far as the nearest oak. Once there, he leaned against it, waiting for Bristlepelt and Grizzle to circle the pond and meet him. Willow saw that her elder�s face was haggard and drawn, and his pale eyes were shadowed. His left arm was carried in a sling, and his coat was torn and bloodied. "What happened to you?" Rainpace asked, coming to a halt before him. Grizzle shoved his way between Bristlepelt and Farscout, and began sniffing the hunter over aggressively. Willow saw with alarm how precarious Farscout�s balance was when Grizzle�s inquisition made him stagger. She reached out automatically to steady him, then jerked her hand back before she had touched. Farscout kept his feet without her help. He tolerated Grizzle�s next shove, then when the old wolf�s curiosity had been satisfied, Farscout sagged down, crouching on his haunches again and leaning his full weight back against the trunk behind him. "A pack of intruders caught Bracken and I in a spot without cover. We killed as many as we could, but they got Bracken." Her elder's voice was raw and ragged; he always spoke softly, but Willow had to strain to hear his weary words now. She didn't miss the fact, either, that he was choosing to speak instead of send. "Two got away, both pretty badly injured. Right now, I've got to rest, but not for long." Rainpace had dismounted. "How bad is your wound?" he asked, kneeling beside their elder. Farscout was cradling his injured arm, and this close to him, Willow could smell his fever and the scent of the wound going bad. Farscout avoided Rainpace�s reach, and his hesitation to answer was as telling as what he didn�t say. "I cleaned it as well as I could, flushed it with boiled whiteroot and pipetree leaves, then packed it with hairmoss before bandaging it," he said, adding, "Just let me rest long enough to catch my breath." Rainpace retreated, casting a deeply worried glance Willow�s way. She met that worry with her own, letting her growing fear show on her face. Farscout had closed his eyes, refusing to acknowledge their silent questions. He winced in pain as Bristlepelt took her turn to nose at his sling, then settled back to catch what rest he could, in what safety he could with Rainpace and Willow to guard him. �Aye,� Rainpace said, with no enthusiasm. He gathered himself up, took up his spear, and followed after Grizzle, with Bristlepelt trailing after. Willow watched until the three had vanished among the trees before she sat down, within reach of her elder but careful not to touch him. Willow put aside her spear and hugged herself, trying to work out how long it would be until they could reach other help. She and Rainpace had run all night just to find Farscout. At best, it would be what -- a day or maybe a day and a half before the Chief and the tribe's herbalist reached them? Kestrel would find them before that, but what help would the glider be? Could Kestrel carry Farscout's weight and still fly? And if so, for how long and how far? Willow's nose prickled at the scent of poison in Farscout's wound. The elder hadn't received the wound that long ago, and poison was already trying to invade it. She knew how quickly gangrene could set in if a wound went rotten, and she knew that despite all of his experience with herbs, Cloudfern's skills as a healer could only prevail so far. She also knew from Farscout's evasiveness that he was worried, and somehow, that shook her most of all. All her life, Willow had known that if she or her friends were to find themselves in trouble somewhere away from the Holt, that the chief would send Farscout to their rescue � that knowledge was a constant, like knowing the moon would follow the sun, or that rain meant clouds. But never had she ever imagined herself called upon to provide rescue for her stoic elder, and in this moment, she felt small and helpless. 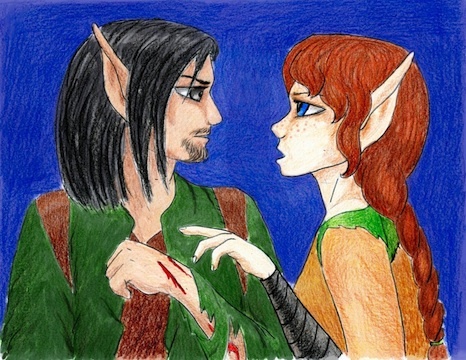 She could guard him while he slept, but if blood poisoning set into his wound and spread, the best any of them could hope for was that Farscout would only lose his arm, and not his life. That was an ugly thought. She struggled to imagine it. If a wound went poisoned, she knew that if the dead and dying flesh wasn�t cut out soon enough, that gangrene would follow, and if that happened, then amputation had to happen if there was any hope of keeping the injured patient alive. Would Farscout settle for the loss of a limb? Would it keep him from ranging the Holt�s borders as he did now? Could he adapt to the loss as One-Leg had, maybe find some craft he could pursue one-handed within the safety of the Holt? Or would the loss cripple him in some soul-deep way so that he withered and faded, like a wolf-friend of her father�s during her youth after it had lost a leg to snakebite. No. Willow rather imagined that Farscout would not be able to settle to new pursuits as One-Leg had, even if it meant that he would certainly meet his death if he went out on his ranging, crippled and unable to use a bow. Farscout was sleeping. The elder had long ago learned to do that, to fall into an easy and light sleep, no matter where he was. She watched him for a time, gaging the rise and fall of his breathing. She watched his left hand, which rested against the side of his chest The hand was in the shadow of his coat sleeve, and she could not tell if the skin was discolored or hot from infection. Cautiously, Willow reached out and touched Farscout�s left hand. The jolt to her senses took her by surprise. Everything seemed to flood into her all at once. Heat, blazing, uncomfortable like a windless, steamy summer afternoon. Something pounded like one of Moss's drums off in the distance. It was far, far away, but the beat was odd, like an irregular beat of a moth's wing. It was unsettling. It said something was wrong. It was, Willow decided, the beating of a heart. There was pain, pain. Pain in the arm, the ache of bones cracked but not split. And around, all around, something lurked like a rogue pack of wolves, rotting, threatening, feeding and growing, and spreading. It was malevolent, black, and reeked of rot. It was the enemy. As if she had become her wolf-bond Grizzle, she had the sudden urge to drive that intruder away. She stood her ground, hackles raising, snarling, and would not let it come any closer. She demanded it leave, NOW. The intruders whimpered, took a step backward. Willow gasped and snatched her hand back, even as Farscout�s eyes flashed open. He recoiled from her with a cry, his pale eyes wild with shock. Willow founded herself recoiling as well. Her belly wanted to heave from shock and from the memory and soul-taste of that black spreading rot. She found herself clutching her left arm tightly against her chest, the memory of throbbing pain, of the retreating blackness still so fresh in her mind that it took her an effort to accept that the wound still Farscout�s, and not hers. �What have you done?� Farscout demanded, his voice a hoarse whisper. �Nothing!� She nearly shouted the denial. �I didn't do anything!� Farscout was still staring at her, his expression wild. Willow scrambled backwards away from him on her hands until she hit the creek, then found herself panting for breath as if she�d run again for hours. Willow�s heart was hammering in her chest; she couldn�t convincingly answer that demand, not with a calm mind. Instead, she took a deep breath and turned her back on Farscout, moving to splash water on her face. The shock of the cold water was bracing. She wiped her cheeks with her sleeve and turned again, this time to face the loud crackling rush of Bristlepelt and Grizzle�s return. �What�s wrong?� Rainpace demanded as he rode Bristlepelt to a skidding stop. Rainpace was looking from Farscout to Willow, frowning � he knew Willow too well to recognize when she wasn�t being fully honest. But Farscout was staring only at her, his face expressionless and his eyes guarded. The weariness,that familiar, awful weariness settled in over Willow's being. She wanted nothing more now than to sleep, but knew she couldn't. They had to keep moving. �Ride with me,� Rainpace said, offering the taller hunter a hand. Farscout took that offer and swung onto Bristlepelt�s back behind Rainpace. Seeing them moving, Willow reached after Grizzle and flung herself across his back. Grizzle pushed his way past Bristlepelt, eager to set the trail. Despite herself, Willow glanced back at her friend. Rainpace�s long, handsome face was earnestly concerned, and beyond his shoulder sat Farscout, pale eyes suspicious and watchful now of Willow�s every move as if her elder were suddenly afraid for her. Or maybe afraid of her. Willow didn�t know which was worse. She turned away and pressed her knees hard against Grizzle�s ribs. The old wolf sprang into a run and set a fast pace, urged on by his rider and by those behind.